The item you write about needs to be posted to your facebook wall, blog, or other social media website so your friends can see it. The post needs to include a link to our shop http://www.etsy.com/shop/PhoenixLaser , and a link to our contest page so others can participate. (this page your reading right now). At the end of the October we will pick one person randomly from the list of people who entered. You must enter by posting us a message by midnight Oct 15, 2010. We have contacted Jennifer via email and FaceBook, as soon as we get your mailing address your Victorian Doll House will be in the mail. We would like to thank everyone who helped us spread the word. As a parting gift to everyone who participated we will be providing laser engraved dog tags with stainless steel chains. We just need you to email us or post here what you would like laser engraved on the front and back of your dog tags. We also need your mailing address so we can send them. Am entering for the Victorian Doll House. 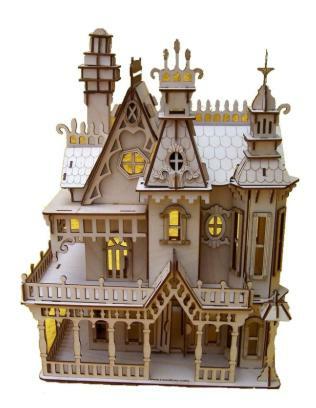 Always wanted a doll house to decorate but we were too poor when I was a girl, then I raised 4 children as a single parent then I cared for my Mom and My Aunt until they passed then I retired and am living on pension so I guess the only way I will ever get one it to win it so here goes. My favorite laser cut item though is the Eifel Tower. Was lucky enough to go to Paris this past summer as a guest of the Nursing organization that I was a member of when I was practicing and I swear this laser cut simulation looks like the real thing. All are really amazing.